I’m obsessed with the space program. Anything about NASA is infinitely exciting to me. My two all-time favorite songs are “Police and Thieves” by the Clash and “This Must be the Place (Naïve Melody)” by the Talking Heads. When I was 10 years old I met Pat Benatar in the bathroom at a recording studio in L.A. She told me she liked my outfit (turquoise capri pants and a Hawaiian print shirt tied at the waist -- remember I was 10.) It was the defining moment of my childhood. I’m (a smidge) afraid of heights…let’s just say I have no desire to ever skydive, bungee jump, swing from a trapeze or participate in any other height required death defying activity. I’m obsessed with notebooks. I have an embarrassing amount of them stashed away and am constantly jotting down little lists. I suppose it's my way of balancing the fact that between my day job and my blog I spend far, far too much time on a computer. 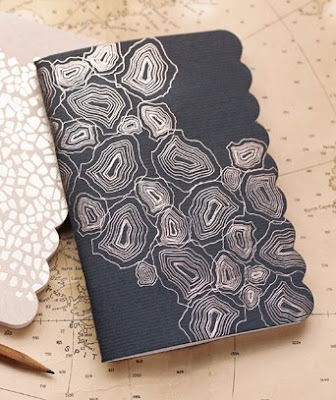 Just leave a comment with your six random things on this post by next Friday and in honor of #6 on my list, I’ll pick one of you to receive Joy’s gorgeous agate notebook above. Happy weekend! Hope it's a splendid one. 1. I once hunted for a lost gypsy graveyard in the Czech Republic with a few other travellers after dark. It was scary. 2. I'm scared of mountain lions. I'm sure one would find me incredibly tasty. 3. Even though I was born and raised in California (and my parents and grandparents were all born and raised here too), I pronounce "ag" words (bag, wagon, drag, etc) like I'm from Minnesota. I have no idea why. 4. A plain bagel with light cream cheese is my favorite quick breakfast. Mmmm. 5. I saw Gwen Stefani at my local farmer's market a couple weeks ago. She is just as glamourous in real life as she is in photos. I need to learn how to rock red lipstick like she does! 6. I looooove sour things. I like to eat lemons raw. 1. I also am obsessed by notebooks and have two drawers full of them, mostly unused. 2. I adore rose and violet creams. 3. I got engaged four months after meeting my now-husband. I was 18. 4. I dye my hair Light Auburn (the name on the pack) as I don't like my greys. 5. I make the world's best chocolate brownies. Fact. 1. I too am afraid of heights. I cannot stand being on roofs, ladders etc. And have absolutely no plan to ever skydive, bungee jump etc. 2. I love spicy food. Salsa, Indian, Thai. The hotter the better. 3. One of my goals in life is to visit every continent. 4. I take my weekends very seriously and try to relish every waking minute. 5. I'm working on getting my event planning company Lilac & Ivy up and running. 6. I'm obsessed with all things online. 1. My legal name is Jessica Gruver Hoover. Yes, I rhyme. 2. I refuse to eat broken Cheerios. Consequently I rarely eat Cheerios because sorting them is time consuming. 3. I've seen Bob Dylan live 7 times. 4. I just got my second tattoo. It's of Conan O'Brien. 5. I'm 29 and have finally decided I want to go to college. 6. Tommy Smothers pointed at me once during a Smothers Brothers concert. Oh, and I made eye contact, like, 5 times with Dweezil Zappa at a concert- he's super hot. 1. I lived in London for a month as a fourth-grader with my family. 2. I can get freaked out by toes. 3. Your blog was the first I read and couldn't stop reading, long before I started my own blog. 4. I like to imagine what my husband and I would be like on Amazing Race. 5. I have always been really flexible. 6. I've given up on high heels for about a year now. Thanks for the giveaway, Joslyn! 1. I love notebooks too! 2. I don't really like cats and can't understand why most people find them so cute. 3. My husband to be is the best looking man I've ever met and I still can't believe he is marrying me - he's way out of my league! 4. I am obsessed with hooks and pegs. 5. I went to the same University as Prince William and once met him having a pint in the local pub. 6. I absolutely loathe celery and hate the way it sneaks into salads without you noticing it is there. 3. I have an irrational fear of styrofoam! It's kind of out of control. I hate the texture, the feel, the squeak, the wierd lightness....gross. 5. I drink water like a camel. I carry around a huge 32 oz. water bottle and refill it at least 4 times a day! 1 : I was not a morning person for most of my life but recently am turning around a bit. 2 : I only ate cheese pizza until I met my husband and he introduced me to the fact that there are other toppings. 3 : I'm really shy when I first meet people and I worry they think I'm snotty because of it. 4 : I'm pregnant with #3 and really, really want it to be a third daughter. 5 : I secretly really like my minivan even though it's so not cool. 6 : Also obsessed with notebooks and I have a basket on my bookshelf full of them. The possibility of a blank notebook is so appealing. 1. I am addicted to Dr. Pepper. 2. I share an office with 21 people and I like every single one of them. 4. I've never owned a television (and I'm 45). 5. I've got a secret that is going to excite Joslyn and make her insanely jealous. 6. my agate notebook just filled up, time for a new one, ha! 1) i like ice in my drinks..except water. i only like it at room temp. 2) i will get off the treadmill to pick up a toy or straighten a picture. 3) i have never liked raisins or coconut. 4) i have been searching for the perfect pair of white pants since as long as i can remember. every year i just settle. 5) i once won $100 at work for smiling all the time. 6) i would organize people's cabinets and closets for free. 1. I think birds are scary. Even pictures of birds. Sometimes, cartoons of birds freak me out. 2. I was on Jeopardy. 3. I had a job to which I had to wear a feather boa. Every day. And it wasn't a theme park. 4. I have broken my tailbone. Twice. 5. My girl crush is Jillian Michaels. 6. I started the FCA(Fellowship of Christian Athletes) and TARS (Teenage Republicans) chapters at my Jewish, liberal high school. The only other member was my younger sister. Youthful idealism at its finest. This was fun! Thanks, Jos! Happy weekend! 1. I'm scared of all bugs with long legs except cockroaches. 2. I am only neat when I have a roommate or if someone will see my space. 3. I view my dog as my younger sister. 4. I work in a fabric store and I tend to change my mind weekly on the fabric I HAVE to have. 5. I hate cats so much I will only refer to them as "cat," even if i know their name. 6. I tend to pick up recyclables on my walk home from work. If everyone did that we'd be much better off! 1. I'm scared of snakes and don't know what I'd do if I saw one in the wild, so to speak. Die on the spot? 2. I lived in Paris for two glorious years when I was 22. 3. I have never gotten over living in Paris. 4. I love spicy food: the hotter the better. 5. I re-read my favourite books when i am in need of comfort. 6. Notebooks, pens, pencils, papers: love them all. 1. I lose my mind with glee when I see a puppy. 2. I love the Japanese aesthetic, especially the minimalist, linen-and-washi-tape sort of look we've been seeing lately. 3. I love baking for people, but not necessarily eating what I bake. 4. I am irrationally and ridiculously afraid of worms. 5. I adore my sister and 2 brothers. 6. I can't stand karaoke. I love making lists! Have a great weekend! 1. I've lived in Texas all my life and am transferring to a school in Michigan this fall. 2. My favorite color is Tuscan Yellow, and somehow people know exactly what I mean by that. 3. Not a fan of celebrity in general, but Christian Bale intrigues me to no end. 4. I enjoy dark chocolate, in all its forms. 5. Being with my dog (Cheyenne), and seeing others with theirs, is wonderfully comforting to me. 6. I love flying & airports. 1. I grew up being called by my Hawaiian middle name until I moved to San Francisco and had to switch to my 'English' name because no one could pronouce "Kehau"
3. I've had "Learn to Walk in High Heels" on my resolutions list for the past 10 years. 4. Between 23-25 yrs old, all my close friends were turning 30, so I convinced everyone that I, too was 30: so much so that we all forgot my real age for a couple years. 5. I secretly want to be a stay-at-home-mom like my own mother but am afraid to stop working. 6. My favorite color is that teal bluish black tint a clear sky gets after a sunset. What is it called? 1. I don't like coffee, so I need lots of Diet Coke to get me through the day. 3. I like onion rings and French onion soup, but I can't stand to eat onions in other dishes. It's something about encountering an unexpected texture. Weird, I know. 4. I was born in Texas and have lived here my entire life, but I love to travel. 1. I can wiggle my pinky toes without moving any of my other toes. My dad could do this too, don't know many others who can. 2. Sushi should be a food group. 3. My first favorite song was "Bad, Bad Leroy Brown" used to dance around the room to it when I was a toddler. 4. I think cookie cutter sharks are the freakiest animals on the planet (google it...terrifying. Thank God I'm not a tuna). 5. I love all trees but Birch trees the best. 6. I have navy blue toenails right now. 1. I don't like flat french fries, I like mine square. 2. Pink and green are my two favorite colors. 3. I adore cookbooks and am always buying/reading new ones. 4. I can't snap my fingers which is kind of hilarious because I am a former teacher. 5. I adore tennis and would play every day if I could. 6. I collect antique tea cups. Yikes! I'm also obsessed with notebooks, so much that I actually have a notebook-problem. That one is just amazingly beautiful! PS. Thanks for hosting the "Oh Hello Friend" giveaway - peacock no longer available, darn it! I loved that one...! Still deciding what to get. 1. My dream is to own a fashion boutique, but I just decided to go back to school and major in political science. for fun. 3. I have an irrational fear of one day getting a paper cut on my eye. 4. I can't wait to be an old lady. I will have the best collection of silk scarves and gaudy jewelry and will dye my hair pastel colors. 5. My favorite snack is japanese gobo. 6. I always read the last page of a book before I finish it. I try not to but the anticipation kills me! I just wanted to say that immediately after reading your list I pulled out my ipod and I'm now listening to This Must Be The Place (Naive Melody). Love this song! Just six random things? Well, here goes. 3. I lost my shoes in Thailand once and it took me over 24 hours to find a place that would sell me new ones. 4. I can listen to Arcade Fire on repeat for months at a time. 5. Until I moved away from Philadelphia, I assumed you could buy cheap and delicious soft pretzels from a man with a shopping cart at all busy intersections across America. 6. I'll look up pictures of baby animals (usually pandas, but not when they're pink and gross looking) when I need a pick-me-up during the work day. Too cute! 2. I am obsessed with sharks, particularly the great white variety. 4. I'm addicted to Mexican coke. 5. I'm officially obsessed with Yu Na Kim, the Korean figure skater who won gold last night. 6. I heart Austin but secretly want to move to NYC. My goodness, I am having fun just reading everyone's "Lists of Six." 1. I once lived in a convent...not as an official nun, but as a volunteer teacher in Los Angeles. 2. I married the man who lived in the "Mother Superior" room in aforementioned convent. 3. I have done two "biggies" just because I said I would out loud to a few close friends...tattoo and sky-diving. 5. I have two kiddies, neither planned and both the best surprises ever. 6. I am actually entirely more responsible than #5 lets on. I've been catching up on all of your blog posts and I just wanted to let you know that I love it! It is fun to read and I love all the images you post. I'll be reading from now on. 01. I also hate bell peppers, although I hate the green ones most. 02. My husband & I are secretly plotting to move to a big city when I'm done school. 03. I am going to two unbirthday parties this weekend. I suspect that one was inspired by the other. 04. Whenever I buy a little black dress, I seem to get the most incredible deals. Today, I bought one for $19. On sale from $120. (It's a rare occurrence, mind you). 05. I am starting a spending hiatus next week, so this would be a really nice pick me up. 06. My husband proposed to me fifty-eight days into our relationship. That notebook is gorgeous, and I love your 6 things. The Pat Benatar scene? That's a lifelong anecdote. 1. I'm obsessed with beaches. Warm, cold, rocky, icy, dune-y, tropical, windy. I don't care. If there's saltwater and me, I’m a happy camper. 4. I dream about living in the American South almost as much as the California coastline. But I just signed a lease on my Brooklyn apartment. 6. Put me in a car with the windows down and I'm a happy girl. I'll go anywhere. Music and sunglasses preferred. Destination irrelevant. a. i have an ongoing affair with Mr. Webster. He is an amazingly wordy lover! b. i insist on drinking champagne from my cherished Marie Antoinette crystal coupes. c. taking a bath in the afternoon pre-dinner is one of my favorite luxuries. It has only happened twice in my life, but I haven't forgotten how good it felt to just leisurely enjoy soaking and then returning to the kitchen at peace to prepare a deliciou meal. d. i'm beyond scared of heights and just the thought of climbing up the Eiffel Tower, made my knees visibly shake causing me to sit on the lawn below in shame. e. i met David de Rothschild today while at a press conference for Plastiki. He is my new hero - a brilliant, earth-loving, good-looking kind man with an adorable dog named smudge. f. cannot get enough of mushrooms. I could live off of them. 1. I have a slight obsession with organizing and purging. I actually do it for fun, yikes! 2. If I had enough tunics or just too short dresses, I would live in leggings. Oh yes I would. 3. I am aching for another baby. Like I want one right now. 4. I'm in love with my bed. Tempur-Pedic pillow top + Dwell Studio sheets. I would stay in bed all day if my boys allowed it. 5. My favorite section of a bookstore is the children's section. I spend far too much time and money in a book store. 6. I have not finished painting my kitchen cupboards. we started last August and just have a tiny bit left to do but I have zero motivation. horrible huh? 2. I am claustrophobic....hate elevators. 3. I love my iMac....but don't want a iPhone....what's that mean? 5. I am on my third marriage, but feel like a newly wed, I can hardly believe that I loosened my grip on my heart...smiles. 6. I have never used my BA in History. 1. I met my husband in line at a bank. 4. Trees and honeysuckles make me happy. 1. I sneak avocados, like a kid sneaking candy. 2. I used to muck stalls on a horse ranch but fell in love with the chickens instead. 3. I like how quiet it is underwater. 4. I still love Pearl Jam, even after all these years. 5. Laying in the grass in the sun with my dog is my perfect activity. 5- I decided this year my husband and I are running a marathon! 3. i think i'm the only girl in hawaii dressed in my cool boots-how cute am i? six: I always always turn off the lights in the mailroom. Why do they need to be left on? They don't. It is a waste. 1. Right now I am in love with the record label, "Ghostly International". 2. I was a diehard tea drinker until I was 38 y/o. Now I am completely addicted to iced coffee. 3. Today I found out how much I miss electricity when my power went out. 5. I love my beagle, who is snoring next to me at the moment. 6. I think your blog is cool. 1. I love all kinds of music, but I really don't like The Rolling Stones, The Beatles, or Sting. They just don't do it for me. 2. Caffeine does bad things to my body, so I cut it out completely about 12 years ago. I miss it. 3. My friend Sara (portlandsunshine.blogspot.com) is the one who inspired me to start a blog. 4. I grew up in North Carolina, but Boston is home. 5. I hated my middle name growing up, and now I have no idea why. Eliza. Pretty, no? 6. Stealing one of Mary's facts (above - thanks, Mary) - I also hated my middle name but now I love it (Mackenzie - my grandmother's maiden name). Oh, I was tagged earlier in the week myself and if you pop over to my blog I've listed my seven things. Great list from you by the way, always fun to learn a bit more about our favourite bloggers. 2. I'm 5 foot 1 - but I tell everyone I'm 5 foot 2. 5. My favourite thing in winter/spring is cracking the ice over puddles. The "crack", the anticipation of not knowing how deep it is, how wet your foot might get, whether it will crack at all... innocent fun. 1. I was born on a Caribbean island and was raise on the coast of Florida, but I don't know how to swim. 2. If I could meet any film star, living or dead, I'd spend time with Fred Astaire. 3. Carbonated drinks make my eyes water. 4. I have cereal for dinner at least once a week. 5. Like many who've commented, I love notebooks, particularly moleskines. Every new endeavor requires a new one. 2. i LOVE bell peppers (sorry). 4. i just got an amazing new part time job at a non-profit fair trade store! 5. i love the juxtaposition of the city and the earth. uno: i took spanish 1,2,3 & 4 and can still only count in the language. dos: i thought i didnt like the winter olympics... turns out i do. tres: my favorite celebrity couple is mandy moore and ryan adams. quatro: my favorite song is breakfast at tiffany's by deep blue something. cinco: ive never downloaded, had it on a cd, ipod, or tape... i love spontaneously hearing it. it reminds me of being a kid. seis: my dog's name is little miss sunshine. 1. I ate Honey Nut Cheerios EVERY night after work when I was pregnant with my daughter. I haven't touched them since. 2. I love HGTV more than any other channel on TV. 3. I went to culinary school and studied pastry. Best time ever. 4. My husband keeps trying to get me to convert to digital scheduling, but I can't give up my paper products. Oh how I love them so! 5. I'm obsessed with blogs, especially design and cooking blogs. 6. When I was 6 I wanted to be a librarian. I thought being surrounded by books all day long would be the best job ever. But then I decided that having to be quiet that much just wouldn't work for me. 1) My daughter, who is almost 5, is obsessed with space and so we are also trying to get her obsessed with the space program. Yay NASA! 2) I threw two hamantaschen in the garbage today because a "cat lady" gave them to me and I thought I saw cat hair (sorry, kinda gross). I felt guilty. 4) if I could wear the same outfit - or nearly the same outfit, with different accessories - every day I would. Dark jeans, long-sleeve black t-shirt, boots. This is exciting for two reasons: 1) This is my FIRST COMMENT ever on a blog. 2) It's a fun topic to explore. 1. I will be going on my second study abroad experience this summer to San Sebastian in Spain, which I am super excited about. 2. I LOVE Bacon! I could eat it everyday, but I would like to keep my arteries intact. 3. I gave up soda six years ago. 4. I moved four times in the second grade (Military father) I lived in Arlington Tx, Houston Tx, Dallas Tx, and back to Arlington TX. 5. During my senior year of high school (2007) Taylor Swift came and played a concert at our pep rally because we one a local radio station contest. 1. I taught Bill Clinton how to milk a goat. 2. Tulips and lilies are my favorite flowers. 3. I could live on dark chocolate and red wine and coffee and cheese and pears. 4. I often have insomnia. 5. I bike to work. 6. I wish my nephews lived closer. I only left 5 things. 1. I am in school for Interior Design, love the classes, but never see myself BEING an Interior Designer, other than for myself. 2. Today is the first time I've worn tube socks in a really long time. 3. When I was younger I was so shy, I have still not met another kid as shy as what I was. 1. i have a debilitating hatred of mayo. 2. when i was little i wanted to change my name to sparkles glitters...much to the chagrin of my mother. 3. sharks fascinate me and are one of my all-time favorite animals. yet, i refuse to go deeper than shoulder height in the ocean for fear that i will be jaws-bait. 4. heaping piles of jewelry upon myself is one of my favorite past-times. 5. i am terribly messy. but a total germaphobe. 6. winter is no friend of mine. i love warmth, sun, and open-toe shoes. French tourists in Bali, Indonesia (yes, pantsed by a monkey)! 2. I fed a wild crocodile in Costa Rica. 3. I have a huge crush on the actor Bill Pullman (who's that you say?). 4. I like to just stare at my daughters while they sleep, and listen to them breathe (or giggle, as my daughter did last night while she was sleeping). Music to my ears. 5. I love being in bed, everything about it, and can sometimes spend a whole weekend in bed. 6. I dated many jerks in my life, but married a true "nice guy" and have never looked back! 1. I am pregnant with number 3 and can not stop eating kumquats...did not happen before. 4. We won 10k in the lottery and love to tell people who say no one ever wins the lottery. 5. I tried to bring a roadkill skunk to kindergarten show and tell when my brother let me walk alone so he could play basketball. 1. I just ate huge sandwich and now I cant move!! 2. My favourite bands at the moment are Rammstein and Metallica. 3. I dont like avocados, black olives, messy houses and bad mannered people. 5. My son is pulling faces at me right now! 6. My mum used to be singer back her day. 1. I don't like bell peppers, either! 2. I feel naked if I forget my wedding ring. 3. I absolutely love strawberries and can't wait until they are really in season again. 4. My best friend and I have the same middle name and our husbands have the same first name. 5. I'd like to learn Spanish. 6. I absolutely believe that my dog has some sort of a soul. 1. I feel uncomfortable eating the same color M&M in a row. 2. I think my husband has the most beautiful hands ever. 3. I daydream about having a house in the country with a gaggle of chickens, cats, and kids. 4. I think bacon is the new black. 5. I feel naked without a scarf on. 6. I collect little notebooks too! I keep 4 in my purse: 1 to track spending, 1 for personal To Do List items, 1 for professional To Do List items, and 1 for happy thoughts. 1. I love the smell of freshly cut grass in the morning. 2. Making an amazing grilled cheese sandwich is seriously a qualification my future husband must meet. 3. I want to go tea tasting. Does such a thing exist? 4. I've rekindled my childhood love for danish butter cookies. 5. No matter how disastrous, rainy weather makes my day. 6. I believe that lemon wedges are the perfect addition to pretty much everything. Fun! That's a gorgeous notebook. 1. I once caught a (small) alligator -- on a school trip. 2. There is nothing better than a stormy day when I can stay home in my p.j.s, drink tea, and sew or knit. 3. In college I had a job sorting recyclables from bags of trash. 4. When I eat citrus my eyelids feel wet. 5. When I found my dog I really didn't even want him and thought he was sort of ugly...but then I fell in love with him and now think he is the most wonderful, beautiful creature imaginable. 6. My dream is to be a farmer. 6. Hate the smell of pine candles--thank you pregnancy! 1. Up until my senior year of high school I always wanted to be a forest ranger. Now I'm an artist. 2. I have less than 5 pieces of black in my entire wardrobe. 3. I hate condiments...ketchup, mustard, relish, mayo, ranch dressing, etc. Yuck! 4. I tell my husband that I would leave him for Bill Murray should the chance arrive. This is totally untrue, but I do really like Bill Murray. 5. I decided to adopt a cat solely based on the fact that he was named after David Bowie. 2.I have always had long hair except for one year when I was 12-13 years old. 3.I look awful in yellow. 4.I try to eat foods with more natural ingredients but cannot give up my Coffee Mate Vanilla creamer, even though it grosses me out to think about it too much. 5.For a while I had the nickname, Sunshine. I always secretly loved that. 6.I cannot sleep without my feet covered, even if it’s hot. 1: Another obsessed notebook fan - notice there's a little common thread here that's making us comment for the notebook!! 4. Love Marie Osmond and am so sad for her & the loss of her oldest son. I used to tape the Donny & Marie show on cassette tapes when I was about 8 years old. 6. Hate skinny jeans but I think I'm secretly jealous that they just don't look good on me! 1.I once almost tipped over in a lifeboat in Alaska. 2. last month I saw 3 different people I knew/once knew on different reality tv programs. 3. My best friend from 2nd grade's father ended up being a serial killer <-- i just found this out.EEP! 5. I really, really hate Mayo, and cannot watch other people eat it. I gag. 6. I have not met a brussel sprout I didn't love. 1. I'm also obsessed with little notebooks too. I've forbidden myself from purchasing anymore, because I have so many. 2. I've tried to give up diet coke a ridiculous number of times, but the sweet nectar always brings me back in. 3. I talk to myself- a lot. 4. I once attended a Train concert at the House of Blues in NOLA. There were about 10 of us and I'm pretty sure 8 were family/spouses/friends traveling with the band. It was crazy loud and my husband put his hands over his ears. The lead singer called him out. 5. Although I grew up in Utah I've only been skiing once. When I was living in NOLA we went for one of our Mardi Gras breaks. 6. I have a closet in my house devoted to my shoes. It seems ridiculous, but most of them I've had for years and years. 1. I just recently started reading blogs and writing my own. 2. I too have a shamefully large collection of notebooks & lists! 3. I love to be hot. Like sit directly in front of the fire HOT! 4. My favorite candy bar is Whatchamacallit. 5. I love to have breakfast for dinner. 6. My favorite thing on a cold day is HOT coffee & on a warm day ICED coffee!! MMMMM!! 1. i am a terrible speller and would be lost without spellcheck. 2. i waste far too much time reading blogs ...for inspiration of course. 4. i enjoy music but can never remember artist names or song titles . 5. i met my husband at bible camp when i was 14 but didn't marry him until i was 28. 6. i adore chocolate...really can't go a a day without it! 1. Marching bands make me cry, hard. I love them. 2. I was born in France, half my family lives there and I studied the language off and on for 7 years and still cannot read or speak it. It's a big source of shame. 3. I eat swiss cheese and peanut butter every day (not together). 4. Orange is my favorite color. 5. If Beverly Hills 90210 is on I HAVE to watch it. Old school, college years, or the new god-awful version. Doesn't really matter. I have to sit down and watch. 6. Cold pumpkin pie for breakfast is my ultimate treat. 2. I'm not normally indecisive. 3. Except when it comes to picking a favorite color. 5. It's my color of choice for a bedroom. or home library. 1. I am terrible at parallel parking, and actually drove over both, 4' tall cones during the parallel parking test when I was 16. I'm not any better 10 years later. 2. I keep a list of things I want to learn: photography, sewing, yoga. I'm slowly working my way through it. 3. Pride & Prejudice is my all time favorite book and it never gets old. 4. I started crying in the opening credits of "Julie & Julia." 5. I love to cook but am afraid of roasting a whole chicken. I keep making excuses for why I cannot ("but the recipe says I need an 11x14 pan and mine is 13x15!". 6. When I was 6 I won first place in a science fair at the Dallas science museum. 1. I love crafting (and recently started a crafts night. We did inspirational collage boards). 2. Scrapbooking is definitely one of my favourite crafts. 3. I consider myself a pretty good cook and healthy eater (my husband is, too). 4. We spend as much on food in a month as our mortgage (scary!!). 5. I live far away from my family, and miss them everyday. 6. I love, correction, I am obsessed with finding "scores" at Thrift stores. It gives me a thrill! 1. I am obsessed with travel. We start planning our next trip on the airplane back. 2. I am equally obsessed with packing light. 3. I am an organizer. I keep lists for everything and everything has a place in my house. I guess that is why I chose to be a CPA. 4. I love photography. I like to stalk photographer's blogs. 5. I love everything Jane Austen. 6. I love challenging myself by cooking meals I never cooked before. 1. I’ve never had a cup of coffee, seriously. 2. I was 21 the first (and only) time I went to Disney World – I thought it was only ok.
3. I was a flamingo for Halloween a few years ago – it was the best costume I’ve had in my adult life. I was a Christmas tree when I was 6 or 7 – that was pretty great too. 4. I’ve never owned a TV & haven’t lived in a house with a TV for almost 4 years – I don’t miss it. 5. I went 30 days without a shower when I was on a NOLS course in Alaska – the first shower post-wilderness was surprisingly anticlimactic. 6. Easter is my favorite holiday – I think it’s pretty. 1. i just went from being a curly-haired blond to a straight-haired auburn. 2. I strongly support multi-generational family . 3. I can read Latin. 4. I can play 7 instruments from 3 musical instrument families. 5. I can't sing soprano to save my life. one. in kindergarten, i shoved a cone-sized chunk of playground rubber up my left nostril 'to see if it would fit.' the school principal and my mother had to come sit in the child-size chairs and wait to see if i would sneeze it out. two. while kayaking in costa rica, i had my passport taken by nicaraguan guerrilla soldiers. three. during a surreal year working abroad, i began dating a french financier who worked for citigroup and lived in a mayfair rowhome next to madonna in london. four. cremini mushrooms make me nauseated. every time. five. subscription magazines are unabashedly joy-producing for me. six. i adore running but invariably get debilitating oblique cramps. still can't figure out how to prevent this. 1. Since starting college this fall I am so full of inspiration and curiosity that I have started following more blogs than I can count! 2. When I was born I weighed three pounds. 3. I have been writing in journals since I was 8 because I wanted to be Harriett the Spy and be a famous writer. I have 43 so far. 4. I have traveled to seven countries so far in my life, and I can't wait to add to the list. 6. In third grade I was in my school's K-8 spelling bee. I came in 4th place, and I still remember the word I missed- "bankruptcy". I was flustered about getting the tricky "t" that you can't really hear that afterwards I said "sy" instead of "cy". I knew right as it was coming out of my mouth that it was wrong, and it still bugs me today. 1. I can very easily become obsessed with a TV show. My current obsession is Top Gear, so funny. 2. I like to sing along to the radio/CD in the car, therefore I never listen to NPR though I know I should. 3. I have and unhealthy love for Kraft Mac n' Cheese. 4. I am currently plotting a way to learn french and rent an apartment in Paris for a month vacation. 5. I love my car, but want an SUV only so I can see around all of the other SUVs in parking lots. 6. I often read two books at the same time, one from the library and one from my bookshelf. -I didn't read any of the above comments. -feels wonderful to not be sick. -I pray that my girls live out their Dreams in Life. -who would have known I would be living in Canada? -did you say I won? Because I am a sketch book hoard. ooh! I guess I'm still in time??? b. I am constantly running out of places to write lists, hence the slew of post-it notes on my desk. c. I spent this past summer cycling across the country from Baltimore, MD to San Fran! 1. My husband and I sing little songs to eachother. 2. I have tiny teeth, it is not as weird as it sounds. 3. Wearing shorts freaks me out. 4. I could eat pizza every day of the week. 5. I am getting ready to think about having a baby (very decisive, huh?). 6. Being in the mountains makes me feel alive. 1 - I love crepes. One summer my friend and I ate them every day at each other's houses. 2 - I still get carded when buying alcohol, even though I'm thirty. 3 - Although I love clothes and have a closet full of beautiful pieces, I usually wear the same thing three days in a row (usually grey skinny cords and a black t-shirt). 4 - I'll eat anything once. I've tried sheep's brain, cow tongue, and chicken feet (the last I couldn't finish, though). 5 - My little sister and little brother are my favourite two people in the world. A fact I've only discovered in the past few years. 6 - I tried soda once, and it was too sweet to drink. I've never had it since (I don't drink coke, pepsi, orange crush, gingerale...). 5. Being aware that I am everything right now! 6. seeing my baby's sweet brown eyes, and thinking that my life is pretty great!! 2) I strongly dislike bananas. I don't like eating them and I don't like to hear other people eating them. 3) I almost always sneeze multiple times in quick succession. My record is 17 sneezes in a row. 5) Tchibo is wonderful...both the coffee and the cat. 6) Only 3 and a half months until the World Cup starts!